An engineer focusing on renewable energy by profession, [Olly] wanted to equip his small inflatable dinghy with a suitably powerful “green” propulsion system. Deciding nothing on the market quite met his requirements, especially for what manufacturers were charging, he decided to convert an old gas outboard to electric. Not only did he manage to do it for less money than a turn-key system would have cost, but he ended up with a system specifically geared to his exact requirements. Something he says will come in handy if he ever gets around to converting the dinghy to remote control so he can use it as a wildlife photography platform. Put simply, an outboard motor consists of a gasoline engine with a vertical shaft that’s coupled to a right-angle gearbox with a propeller on the end. Beyond that they’re a fairly “dumb” piece of gear, so replacing the engine on top with something else should be (at least in theory) a pretty simple job. Especially on the small older model that [Olly] decided to use as a donor unit. The 1974 Johnson 2 HP motor didn’t have any tricky electronics in it to contend with; the thing didn’t even have a clutch. 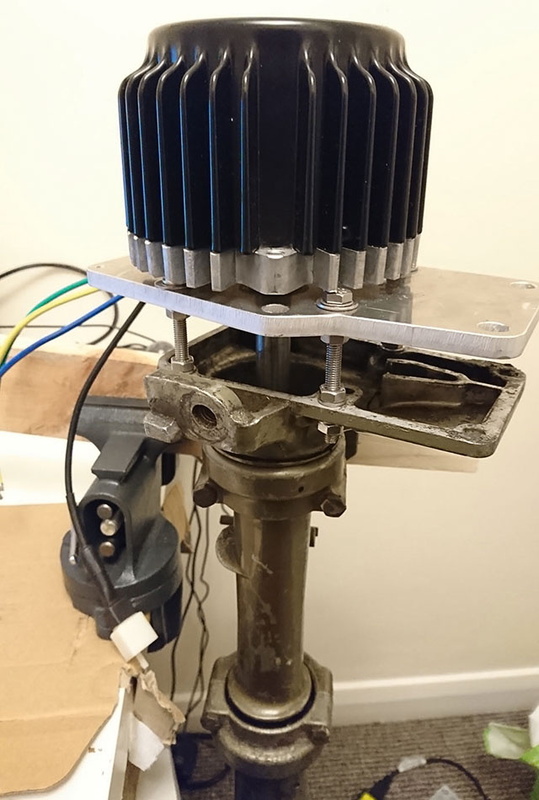 Once [Olly] had removed the old gas engine from the top of the outboard, he designed an adapter plate in OnShape and had it cut out of aluminum so he could mount a beefy 1 kW 48 V brushless electric motor in its place. Connecting the new electric motor to the carcass of the outboard actually ended up being simpler than putting the original motor on, as this time around he didn’t need to reconnect the cooling pumps which would usually pull water from down by the propeller and recirculate it through the engine. While the mechanical aspects of this project are certainly cool, we’re especially interested in the control system for this newly electric outboard. It uses a 3.2 inch Nextion color touch screen and Arduino Nano to provide a very slick looking digital “dashboard” which can convey motor status and other information at a glance. Unfortunately, [Olly] says the details on that part of the project will be saved for a future post, leaving us with only a single picture of the system’s interface for us to drool over until then. We’ve seen the occasional seafaring project that made use of an electric trolling motor, and we’ve even seen an electric drill put in some overtime spinning a prop in the water. Converting gasoline boat over to electric is however a rarity. But much like electric car conversions, such projects may become more common as the cost and complexity of powerful electric propulsion systems continues to fall. Kayaks are a some of the most versatile watercraft around. You can fish from them, go on backpacking trips, or just cruise around your local lake for a few hours. They’re inexpensive, lightweight, don’t require fuel, and typically don’t require a license or insurance to operate. 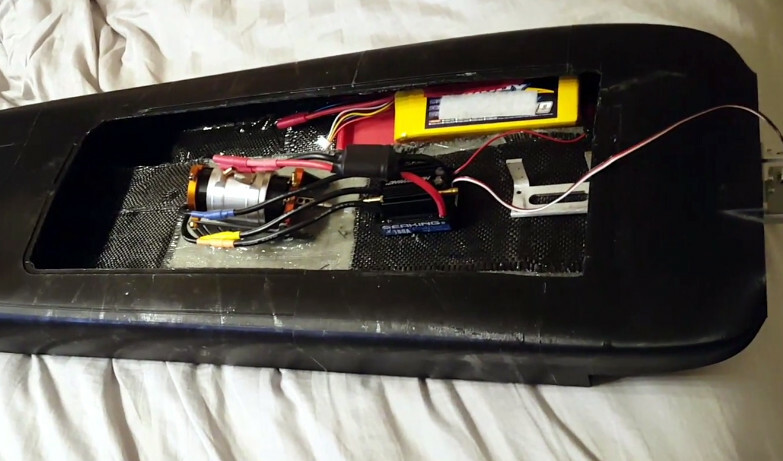 They also make a great platform for a solar-powered boat like this one with only 150 watts of panels and a custom-built motor with parts from an RC airplane. [William Frasier] built his solar-powered kayak using three solar panels, two mounted across the bow of the boat using pontoons to keep them from dipping into the water, and the other mounted aft. Separating the panels like this helps to prevent all three of them being shaded at once when passing under bridges. They’re all wired in parallel to a 12V custom-built motor which is an accomplishment in itself. It uses custom-turned parts from teak, a rot-resistant wood, is housed in an aluminum enclosure, and uses an RC airplane propeller for propulsion. Without using the paddles and under full sun, the kayak can propel itself at about 4 knots (7 kmh) which is comparable to a kayak being propelled by a human with a paddle. With a battery, some of the shading problems could be eliminated, and adding an autopilot to it would make it almost 100% autonomous. Archer fans and residents of Louisiana will already be familiar with the concept of the airboat. Put a powerful engine running an aircraft prop on a flat-bottomed hull, and you’ve got an excellent way to traverse the marshes of the American South. While a fully-fledged airboat might run you the best part of $100,000, this no-frills radio-controlled version is great fun at a much lower price. The hull is built on a sheet of foam, which is cheap, readily available, and suitably buoyant for the task. 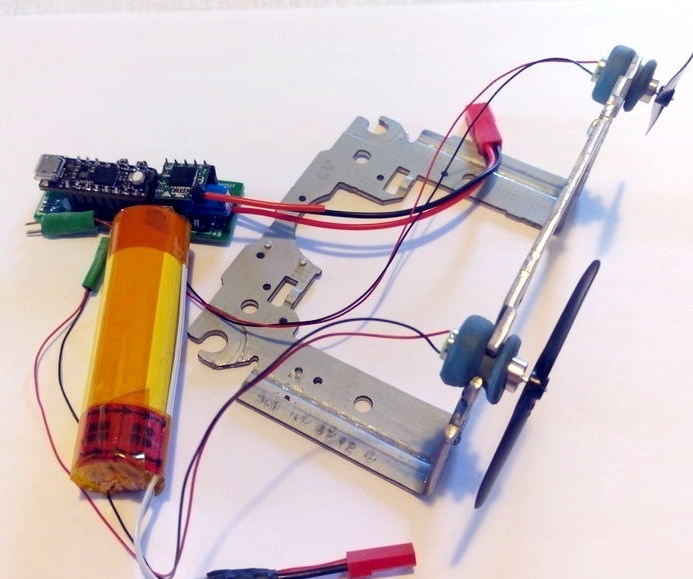 It’s then kitted out with a brushless motor to run the prop and a servo to control the rudder. Lace it up with a radio receiver and speed controller and you’re good to go. For as much animosity as there was between sailors of surface vessels and those that chose the life of a submariner, and for as vastly different as a battleship or cruiser seems from a submarine, they all had one thing in common: the battle against the sea. Sailors and their ships are always on their own dealing with forces that can swat them out of existence in an instant. As a result, mariners have a long history of doing whatever it takes to get back to shore safely — even if that means turning a submarine into a sailboat.